Broward County (Fla.) Public Schools’ transportation department served a vital role in responding to the shooting, which occurred at Marjory Stoneman Douglas High School. 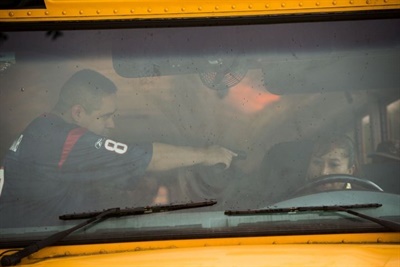 Drivers transported students and staff away from the scene to a hotel designated as a meeting place to reunite with parents, family, and friends. In the wake of the tragedy, the district is reviewing its standard practices and procedures. The transportation department is working with district leaders to develop a plan that includes short- and long-term solutions that will impact student transportation emergency and crisis operations and safety measures, says Nadine Drew, a spokeswoman for the district. Taking a more comprehensive approach that involves all school staff members and doing more to empower school bus drivers are two steps recommended by Dr. Stephen Sroka, president of Health Education Consultants, adjunct assistant professor at the School of Medicine at Case Western Reserve University, and longtime school safety expert. When Sroka gave his presentation “The Power of One, the Power of Many” at the Oregon Pupil Transportation Association (OPTA) Winter Workshop in Eugene on Feb. 24 to more than 800 school bus drivers, he was struck by a statement from a driver in the audience and the reaction to it. That degree of dedication illustrates Sroka’s point that bus drivers are essential to safety plans. This is particularly important because he has found that students sometimes feel more comfortable talking to their bus driver than to their counselor. Buses should be parked in a secure area, says Gary Moore, safety specialist at Missouri School Boards’ Association. He recommends that transportation departments take advantage of the Transportation Security Administration’s (TSA’s) free security assessments for schools. Pre-trip inspections should also be conducted consistently and thoroughly, Moore adds. Other TSA location security tips include locking the bus, if possible; not leaving it unattended or out of sight; and looking for out-of-place items such as a canister, propane-style tank, metal box, or bottle. Drivers should check on details they notice on or around the bus that “Just Don’t Look Right” (JDLRs) and notify authorities. Examples of JDLRs include a student on the bus being dressed completely differently for no specific occasion; a backpack or bookbag left on the bus; or a vehicle following the bus for no known reason, Moore says. “Most kids will show you. If they don’t, that’s a JDLR,” Moore notes. He also recommends watching the hands of anyone who seems suspicious. When spotting suspicious items or behavior, the TSA recommends immediately calling 911; refraining from using radios or cell phones within 300 feet of the item; noting its location; and not moving or touching the item. When reporting, be prepared to include the location, and the physical appearance, gender, and unusual characteristics of any people involved. Additionally, Moore says, never let any unauthorized person on the bus. Instead, offer to discuss their issue off the bus, and when they get off, shut the door and report the incident. If they succeed in boarding the bus, demonstrate a willingness to listen and be calm. Use physical force only as a last resort, and commit to your actions. Outside the bus, if confronted by an active shooter, or if one is in the vicinity, the TSA advises quickly determining the most reasonable way to protect your own life. • Have an escape route and plan in mind. • Leave your belongings behind. • Keep your hands visible. • Choose an area out of the active shooter’s view. • Block entry to your hiding place and lock the doors. • This should be a last resort, only when your life is in imminent danger. • Attempt to incapacitate the active shooter. • Act with physical aggression and throw items at the active shooter. “Let kids know that if they see something, say something, because you’re trying to keep everyone safe,” he adds. If an intruder succeeds in boarding the bus, the driver should demonstrate a willingness to listen and be calm. Pictured here is an armed intruder training that took place at Houston (Texas) Independent School District. 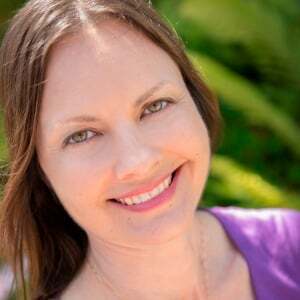 “Many times kids will feel more comfortable around people who know what to say and do. It’s good to get into a supportive, comfortable [environment] like a school,” he says. Shown here is the NEDAP combi booster reader from NEDAP Identification Systems, in use at Hollister (Mo.) R-V Public Schools. 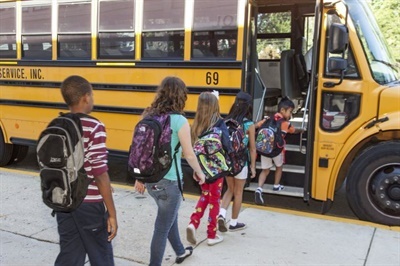 A Missouri school district has seen success in implementing technology that enables only authorized bus drivers to enter and leave the premises with their assigned vehicles, to prevent theft or hijacking of a bus. Two years ago, Hollister R-V Public Schools installed a device in its school buses called a combi booster: a rear transmitter device with its own identification that allows the school to use a standard access credential, like building access cards, to secure the buses and the yard, says Gorm Tuxen, business development partner for NEDAP Identification Systems, which makes and installs the technology. Bus drivers insert their building access card into the device on the bus, and it communicates with a reader on the bus yard’s perimeter so that the gate only opens if it has the right combination of bus and driver for that allocated time slot to enter or exit the yard. With the combi booster device, drivers don’t have to open or reach out a window. The long-range reader senses the vehicle approaching, and the gate will start opening as the driver approaches the perimeter. “The vehicle keeps moving through the barrier, which eliminates a potential attack point for someone [trying to] capture the vehicle, and legitimate vehicles move to the safe side of the perimeter,” Tuxen says. 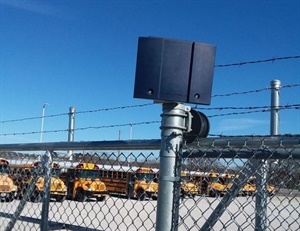 “The NEDAP identification system allows us to not only easily access and secure our bus yard, but also to know who is driving by employing [NEDAP’s] Dual-ID technology, which can prevent a stolen credential from being used for access,” says Sean Woods, assistant superintendent of the district. I set from the 4 lane I see smitruck go buy they have lights from one end to the other. My thoughts were why can't you do the buses this way because people can't see the buses and run into them if the buses have all of these lights on the like the truckers can't miss them and I believe it would help and save you money. Just a thought.